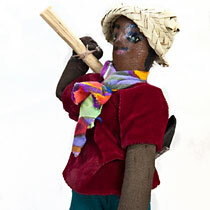 Male doll from the culture of Haiti handcrafted from paper mache. 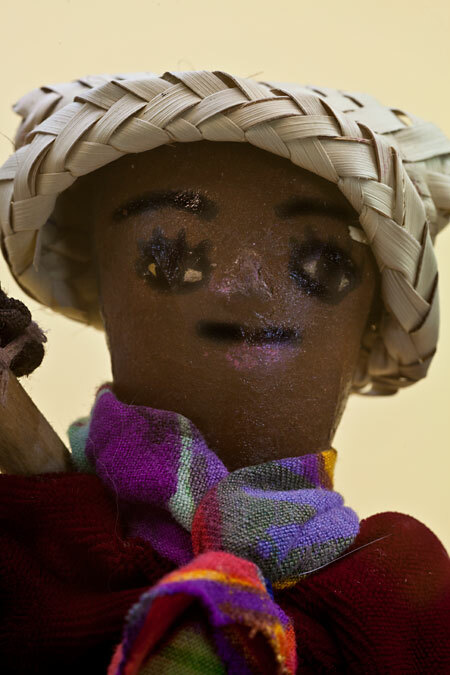 He has a hand-painted face, and is wearing a hat made of straw. 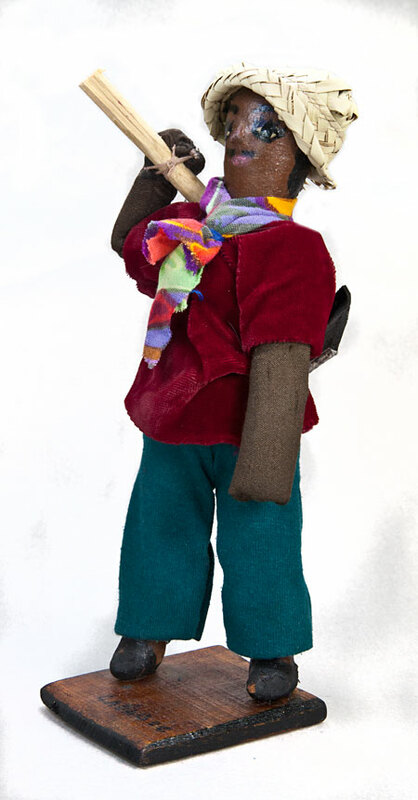 He is wearing a shirt made of red velvet, a cotton scarf and knit pants. 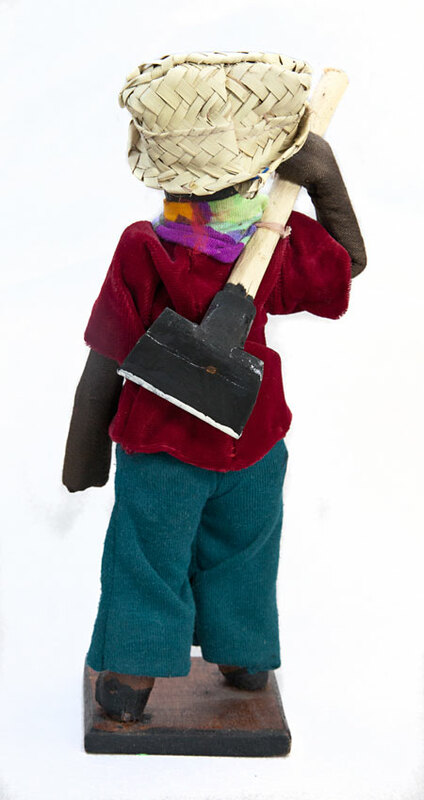 He is holding a hoe, made of wood, over his shoulder. The stand has the word, LABADEE, hand-painted on it. 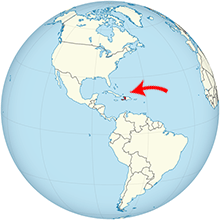 Labadee is a port on the northern coast of Haiti, and is often frequented by cruise ships. 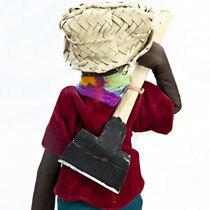 My name is Brignoi, and I am a farmer on the Caribbean island of Haiti. I work very hard, yet I am very poor. During harvest, I take my crops to the city (Port Au Prince). However, I earn only a few gourdes, which is the money that we use in Haiti. That’s not enough money for my family to be able to eat three meals a day. When I go to the city, I usually bring my daughter, Elirose, with me. I know life is hard for her. I can’t afford to buy her nice clothes or proper shoes. Her hands are rough because she works in the fields in the heat of the day. Her face is not that of a 10 year old, but rather that of a young woman who knows her life is not going to be easy. Elirose and I are both black as coal and this color hurts our chances of success in Haiti. It is the people with lighter skin (mulattos) who get the better jobs, the better education, and the finer homes. It is hard for Elirose to understand how we can work so hard, and yet not afford basic food and clothes. I am heart broken when I look at Elirose, for she is beautiful and proud even though she has so little. As we drive the mule and cart through the streets, it is very difficult to maneuver through the millions of people, the cars, and the vendors trying to sell their wares. Port Au Prince is a crowded, dirty city. Many of the streets are piled with garbage, and the streams are black with sewage. People live on the streets or in crowded shacks. Why do we have to live like this? One day, we went by an orphanage called Foyer de Files de Dieu (that’s French for Home of God’s Girls). I watched as Elirose stared in awe at this marvelous structure. Suddenly, I thought that I should leave my daughter here so she would have a chance to survive in this country. 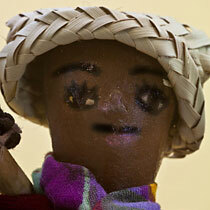 I wanted her to be free of the hard work of plowing the land and cutting sugar cane with machetes. If she were in this orphanage, she would not have to worry about the mosquitoes we face each time we work in the field. And most of all, she would be able to have good food that would make her strong and healthy. I realized that my wife would be hard to convince, but I saw no other way. I knew that the orphanage had room for about 60 girls, and they spent their mornings in school and their afternoons taking classes in cooking and dance. The orphanage also had a clinic with dental and eye care. What a miracle it would be if I could get Elirose into this orphanage. I knocked on the giant wooden door and waited until a woman came to open it. She looked at me in surprise and asked what I wanted. I told her that I was the father of Elirose, and asked if Elirose could live there. At first, she told me that they only accepted orphans. Then the woman looked at Elirose’s clothes and realized how desperate I was. She knew that my daughter might never survive in her current conditions. Meanwhile, Elirose looked around at the giant rooms where the children gathered and sniffed the aromas of food from the kitchen. The lady then asked Elirose if she would be willing to leave her family and live here. Elirose looked at me with sadness in her eyes and felt a pang of regret in her stomach. 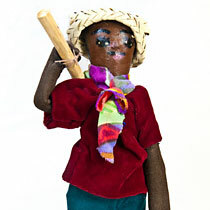 The lady informed her that the orphanage was supported by religious groups and there was no room for Voodoo, which many of the people in Haiti practice. 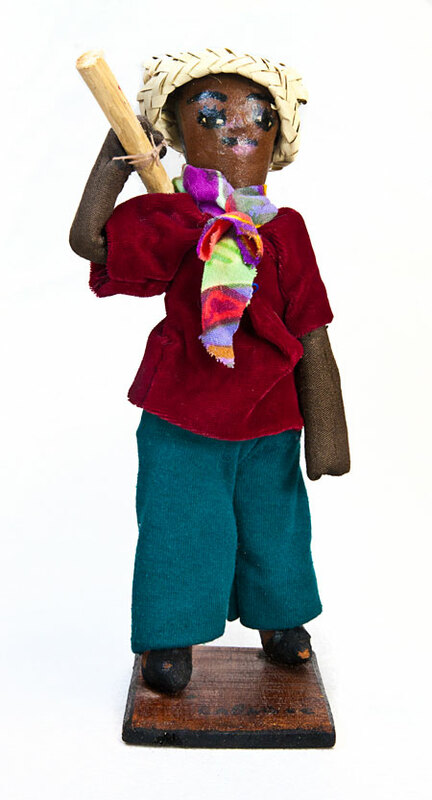 Elirose grew up with Voodoo spirits, a religion from Africa that was brought over by the slaves. 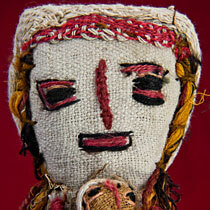 If she entered the orphanage, she would not be permitted to perform ceremonies to heal diseases or end bad luck. 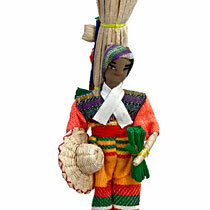 There would be no animal sacrifices or dancing rituals, which were so important to many Haitians. I was very proud of my little girl as she got back into the cart. We said good-bye to the lady at the orphanage and urged the mule through the crowded streets towards our home.